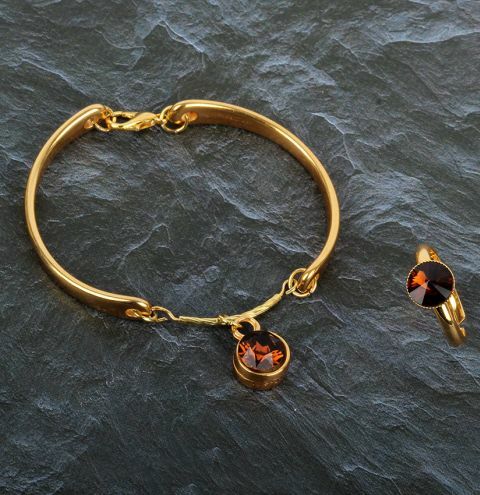 Make a matching ring and bracelet using materials from the Pre-Black Friday Clearance! Apply a drop of glue into the ring base, set your crystal into place and allow to dry. Push a gold eyepin through the tube and turn a loop at the end. Connect the bar to both parts of the bracelet with a jumpring on either side. Open a jumpring and link the charm to the centre bar. Connect a jumpring to each end of the bracelet and on one of them attach the lobster clasp. Glue the crystal into the setting and allow to dry.